Anybody else need a cigarette? What a win. Stanford has been an absolute boogeyman for the Irish under Brian Kelly, and last night the Irish took them behind the damn woodshed. The rejuvenated Irish we saw against Wake Forest were back and looking for more against a higher caliber opponent, and they delivered in spades. For the second week in a row, Ian Book made Brian Kelly’s decision to change quarterbacks look brilliant. The expectation was that Stanford would try to take away the short throws that Book hit early and often against Wake Forest, but Book still carved them up for 278 yards and 4 TDs. He was poised and efficient, showed good mobility both in the pocket and occasionally downfield, and kept the Irish out of the turnover column again. Book continued to showcase his ability to distribute the ball well, once again completing passes to ten different Irish players, but it was Miles Boykin having a career night with 11 catches for 144 yards and a score. Dexter Williams, come on down! What a return for a guy who has struggled to find meaningful snaps for a large portion of his career at ND. 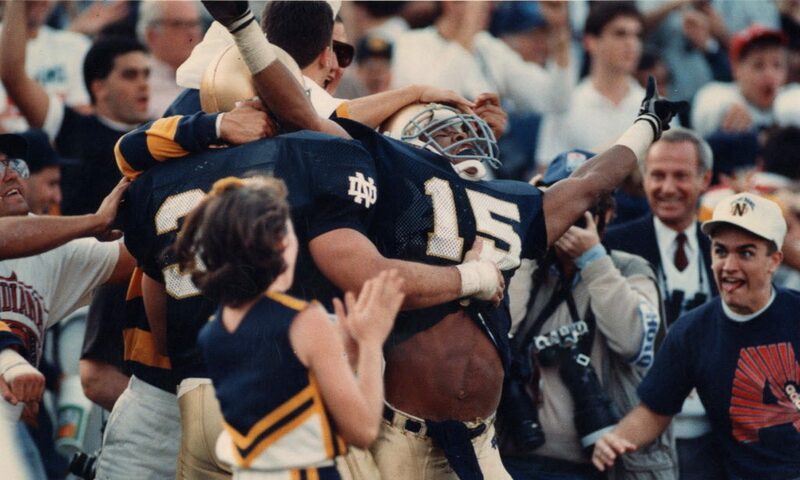 Williams flashed a gear that the other Irish running backs have not, pulling away from Stanford defenders on his 45-yard touchdown run, but his capabilities as a home run hitter were never in question. Even without his long touchdown run, Williams averaged 5.8 ypc on his remaining 20 carries. That’ll certainly answer the bell, particularly as the Irish look to be without Tony Jones Jr and Jafar Armstrong for the immediate future. For as good (and fun) as the offensive performance was, credit the defense for absolutely choking the life out of Stanford in the second half – after the intermission, the Cardinal mustered just 34 yards of offense. Julians Love & Okwara were their usual dominant selves, and Te’von Coney recorded his first career interception to set up the dagger Alize Mack touchdown. Drue Tranquill had a massive highlight tackle, absolutely planting a Stanford wide receiver on a third down screen pass, getting the Irish the ball back late in the second quarter. The true star of the defense tonight, though, was Jerry Tillery, playing like a man possessed and tying the ND single-game record for sacks with four. Much ink has been spilled over Notre Dame’s recent struggles with Stanford, but tonight the Irish absolutely looked like the better team. There are few things better in life than forcing David Shaw to answer uncomfortable questions at a press conference,* and for that we thank the boys in blue and gold. The Cardinal looked out-coached, out-muscled and flat out-played. Former Heisman candidate and future pediatrician Bryce Love was extremely pedestrian, averaging 2 ypc outside of a 39-yard scamper, before exiting the game with an injury. Ultra-scary tight end Kaden Smith hauled in exactly one catch for four yards, so we can go back to sleeping with the lights off. JJ Arcega-Whiteside got the better of Julian Love for an early touchdown, was but silenced thereafter. Great stuff. One stain on what was otherwise a thoroughly enjoyable night of Irish football – injuries to Alex Bars and Tony Jones Jr, both of which looked like they could be fairly serious. Hopefully both are able to bounce back quickly, because the the next eight weeks are certainly going to be a grind. Notre Dame has likely already played its two toughest opponents, but a demolition of a Top-10 opponent raises the ceiling for this team considerably. I’m not prepared to go full Jim Mora just yet, but after the performance we saw tonight, Notre Dame just might be a contender. *Beating Michigan, for one. Check.